Barefoot Resort is home to four of the finest golf courses in Myrtle Beach and one of everyone’s favorites is the Fazio course. Five times voted the “Golf Course Architect of the Year”, Tom Fazio laid out a jewel at Barefoot Resort. The Fazio course is unique to American golf courses as it does not return to the clubhouse after the front nine, making it similar to European courses. The comparison to Europe ends there, as it does not have a links style layout, rather a beautiful Lowcountry style that features native grasses, natural areas, beautiful live oaks, pines and sand. The Fazio course plays to a par of 71 and stretches to approximately 6800 yards. Five sets of tees are available so that all skill levels can enjoy this wonderful course. The course winds through many lakes, natural areas, waste bunkers and wooded areas. Natural elevation changes offer outstanding views as water can be seen on 15 holes. The fairways feature GN1, the approach areas Tif-Sport Bermuda grass, roughs 419 Bermuda grass and the greens roll great with Champions Bermuda grass. The Fazio course is the perfect course to include on your next Myrtle Beach golf trip. It is conveniently located on Hwy. 17 in North Myrtle Beach which makes it very accessible to many other great Myrtle Beach attractions such as Barefoot Landing. 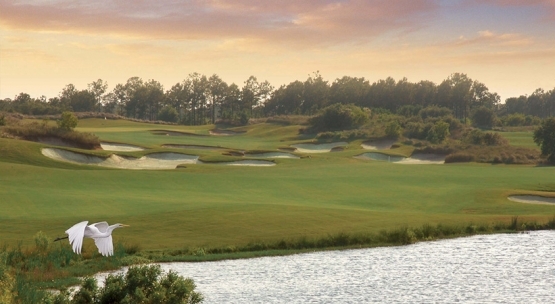 Be sure to check out the Barefoot Resort Fazio course on your next Myrtle Beach golf package.